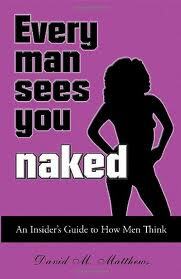 We recently had the chance to review the book "Every Man Sees You Naked" by David M Matthews. "Employing equal measures of wit and wisdom, Emmy Award-winning composer/writer/producer (The Young and the Restless, The Nanny, Half & Half) David M. Matthews leads you on an amusing yet highly informative journey through the seamy underbelly of the male mind. Shameless in its honesty and lacking any pretext of political correctness, Every Man Sees You Naked explodes the myths about men and answers the questions you've been dying to ask but didn't quite know how. -Why almost everything you believe to be true about men isn't"
What we thought: This book is incredibly informative and really gives women an insider's view of the male mind. I must warn you, though, while this book is written with the intent to inform and entertain (and it does both very well:) the writer is quite blunt and the language would definitely be considered adult. This book is not for the faint of heart, but if you would like to know more about what men think and why they think it and you don't mind crude language and humor, you will really enjoy this quick read. ABCD Diaries gives "Every Man Sees You Naked" an A+! Buy It: Find this informative book at your favorite bookseller.